In the North End / Waterfront area, look for the Greenway Open Market to return, free fitness activities, labyrinth walks at the Armenian Heritage Park, and free Friday carousel rides. In September, the Greenway will again host the Carnival of Dogs and the Mass Military Heroes 9/11 Service Project near the Rings Fountain. Read details about all the Greenway events below! 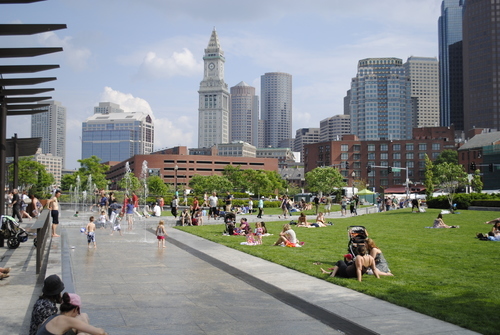 The Rose Kennedy Greenway Conservancy announced the majority of its event calendar for 2017, with major festivals, markets, fitness classes, volunteer opportunities, family play offerings, and more. Over 400 free events are expected, drawing hundreds of thousands of visitors. The Greenway will host numerous major festivals this year, all free and open to the public. Race Amity Day will be on June 11. Brazil on The Greenway, organized by the Brazilian Consulate, will be on July 15. My Caribbean One World Expo will be July 15, and the African Festival on July 29. The FIGMENT Boston participatory art festival will be July 22 and 23. Chinatown Main Street will bring the Chinatown Main Street Summer Festival on July 1 and the Lantern Festival on September 30; Chinatown Park is also the site of August Moon Festival on August 13. The Carnival of Dogs, sponsored by TD Bank, returns to the North End Parks on September 9. The Mass Military Heroes 9/11 Service Project to Support Our Troops & Families will again be near the Rings Fountain on September 11. Additional festivals are expected to be scheduled. Recurring events will feature music, fresh food, artisan crafts, and film. The Boston Calling Block Parties with music, beer, and wine has returned to Dewey Square Park every Thursday evening through September. Dewey Square also welcomes the Boston Public Market Association’s seasonal farmers market on every Tuesday and Thursday from May 16 until November 21. Visitors can “shop handmade” every Saturday and alternating Sundays through October 28 at the Greenway Open Market in the Wharf District. Coolidge on the Greenway will return for the third year with Twister (June 27), Back to the Future (July 18), and King Kong (August 8). The Asian Community Development Corporation will for the 12th year bring Films at the Gate to Chinatown Park from August 25-27. Over 100 free fitness classes are scheduled, with the 2017 fitness season presented by Blue Cross Blue Shield of Massachusetts. The first class of the season, MSL Pilates Bootcamp by Ali Baldassare, will be June 12. Classes will also include yoga, cross-fit, tango, and more from partners including InnerCity Weightlifting, Boston Workplace Fitness, Good Morning Yoga, Health Yoga Life, Republic Fitness, North End Yoga and Tango in the Park. Greenway classes offer healthy living throughout the park: steps from the Chinatown Gate, near the Rowes Wharf Arch, and just off the Freedom Trail in the North End. Labyrinth walks at the Armenian Heritage Park will occur on June 21, July 19, and August 16. The Conservancy has more than 50 free play activities for children planned this summer, and numerous volunteer opportunities. Our programming includes weekly play sessions in Chinatown Park on Thursday evenings and Downtown Playdates in collaboration with nearby destinations. Additionally, the Conservancy will continue its partnership with the Boston area youth organizations including the Boys & Girls Clubs of Boston, hosting 16 clubs for “Youth Adventure Days” on The Greenway, as well as school and preschool visits to Chinatown Park. The Asian Community Development Corporation’s youth program, A-VOYCE, organizes SaturPLAY, a monthly series featuring a different theme with games, activities, crafts, and more. Free Fun Friday at the Greenway Carousel at The Tiffany & Co. Foundation Grove, sponsored by the Highland Street Foundation, will offer free carousel rides on August 4 and will be paired with our Truck and Tractor Day event. Individuals can volunteer alongside Conservancy horticulture staff every other Wednesday from March to December, and volunteers also help as Art Ambassadors, Play Ambassadors and other roles (rosekennedygreenway.org/volunteer). The Conservancy will hold two ticketed fundraising events on The Greenway in June. At the Greenway Gala on June 8th, the Conservancy will honor Citizens Bank with the help of co-chairs Jeffrey P. Beale of Eaton Vance and Michael J. Carragher of VHB; sponsorships are currently available. Tickets are currently on sale for the June 9th Glow in the Park young professionals event; last year 500 people enjoyed live music, performances, food, and beverages while supporting The Greenway. These scheduled events complement the park’s ongoing fun. Numerous public art works with the theme of “Playful Perspectives” will be on display. The Greenway Mobile Eats Program season kicked off on April 1 with 35 trucks and trikes, and the Greenway Carousel at The Tiffany & Co. Foundation Grove is already spinning daily. The free, carrier-grade Wi-Fi network stretches the entire 1.5 mile length of The Greenway. The seven water features will be turned on by late May to cool off visitors. And the organic lawns and lush gardens invite visitors to pause and contemplate. A pilot beer garden in partnership with Trillium Brewing Company will launch in early summer for 3-5 days/week. Many events are still completing permitting and are subject to weather. A full calendar is available at www.rosekennedygreenway.org/events/calendar/ and updates are available by following @hellogreenway on Twitter.